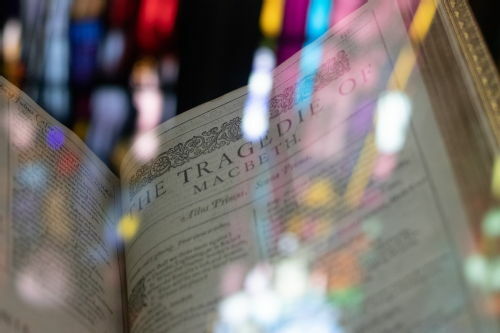 The MA in English and Drama offers an exciting opportunity to specialise in the study of dramatic texts and theatre history while maintaining a range of interests within the field of literary studies more broadly. You will be working with leading experts in Shakespeare and early modern drama, theatre history, and modern performance theory and practice. This MA combines a focus on dramatic texts and theatrical performance, and includes the option of a professional placement or an extended practical project. It allows you to combine your interest in drama with the English department’s other offerings, including its cutting-edge modules in postcolonial and world literature, and critical and cultural theory. You will be able to take advantage of easy access to the Royal Shakespeare Company at Stratford, and to major theatres in Coventry, Leicester and Birmingham. On campus, Warwick Arts Centre, the largest of its kind outside London, is visited by companies of international standing specialising in both the established repertoire and new work. Over the course of the year, you will take four modules (two in each term). One of these is the core module, Drama and Performance Theory, which will give you the opportunity to explore and discuss some of the key conceptual approaches to drama and performance, both current and historical. This module is taught by a team of tutors with a variety of research specialisms, so you will encounter a wide range of ideas and approaches. You will also take a further 30 CATS, which may be from the English department (including, if you like, an additional one of the modules listed above) or, with approval of the course convenor, any department across the Arts Faculty or from the Institute for Advanced Teaching and Learning. The course will conclude with a 16,000-word dissertation, a professional placement, or a practice-as-research project (each 60 CATS). The dissertation will allow you to pursue an independent research project, developing a specialised insight into your selected topic. You will engage analytically with key debates and major theoretical concepts in your chosen field, and learn key research skills. You will be assigned a supervisor who is a specialist in your chosen topic. Alternatively, you can choose to pursue the Professional Practice or the Practice-as-Research dissertation options. The Professional Practice dissertation allows you to undertake a six-week placement with a professional theatre company or similar organisation, developing your knowledge of professional practice in the fields of literature, theatre or performance. You will need to approach the organisation you plan to work with, and the department will support you in this. You will use your placement to explore clearly-articulated research questions, and reflect critically upon these questions in a written submission. The Practice-as-Research dissertation, meanwhile, offers the opportunity to undertake a research process that leads to the creation of an artistic output (such as a script or a performance). During the Autumn Term you will attend a series of workshops designed to help shape your general ideas into a feasible proposal. You will then submit a full proposal towards the end of this term and be assigned an appropriate supervisor, before beginning preliminary work on your project in Spring Term. For information about how to fund your masters degree please consult our own graduate funding page and the Graduate School's list of available scholarships and bursaries. The department's two Performance and Pedagogy Bursaries, each worth £8,000, will be of particular interest to applicants with interests in practical theatre and education. The University has recently launched the Warwick Taught Masters Scholarship Scheme for Home/EU students. The department has broad and deep research expertise in theatre, ranging from medieval to the present day (and including the classical tradition). We have strengths in performance as well as text-based research (such as editing), so the MA offers a range of ways of reading and engaging with drama. The MA in English and Drama is new for 2019-20. However, students from Warwick’s English and Theatre undergraduate degree have gone on to become successful playwrights, directors, actors, dramaturgs and other theatre practitioners, theatre reviewers, arts journalists and many other related professions. Many Warwick alumni theatre companies (including Barrel Organ, Clown Funeral, Feat. Theatre and Emergency Chorus) return to campus for the annual Emerge Festival. You will be joining a department that values its graduate students and encourages them to become part of our thriving research culture. You might get the chance to present your work in a professional context at our annual Postgraduate Symposium, or take part in international conferences such as our recent The Descent into the Classical Underworld. We are home to the journal Feminist Dissent, have a busy diary of visiting speakers from around the world, and close connections with, amongst others, the Early Modern and Eighteenth Century Centre, the Yesu Persaud Centre for Caribbean Studies, and the Centre for Philosophy, Literature and the Arts. This course might be particularly appropriate for students with a Joint Honours degree in English and Theatre/Drama, but any student wishing to expand their knowledge of drama is equally welcome, and no prior knowledge will be assumed. Please contact Dr Stephen Purcell (S.Purcell@warwick.ac.uk) if you have any questions about the MA in English and Drama. 65% (or equivalent) in an undergraduate degree in English literature or a related degree. Applicants may be required to provide a writing sample to demonstrate suitability for the course. Four departmental bursaries available, worth £4,000 per student. These are open to all Home/EU and Overseas applicants, and will be awarded based on academic merit. To be eligible, you must hold an offer for one of our MA courses. The department also offers two Performance and Pedagogy Bursaries, each worth £8,000. These are particularly suitable for applicants with interests in practical theatre and education.